I ended March with the declaration that my kids and I would attempt to go vegetarian for one month. As is usually the case with best intentions, there were a few stumbles along the way; however, I think some interesting things came about because of our challenge. My kids are not as picky as I thought. I knew that about my son, but I did not know that about my daughter. 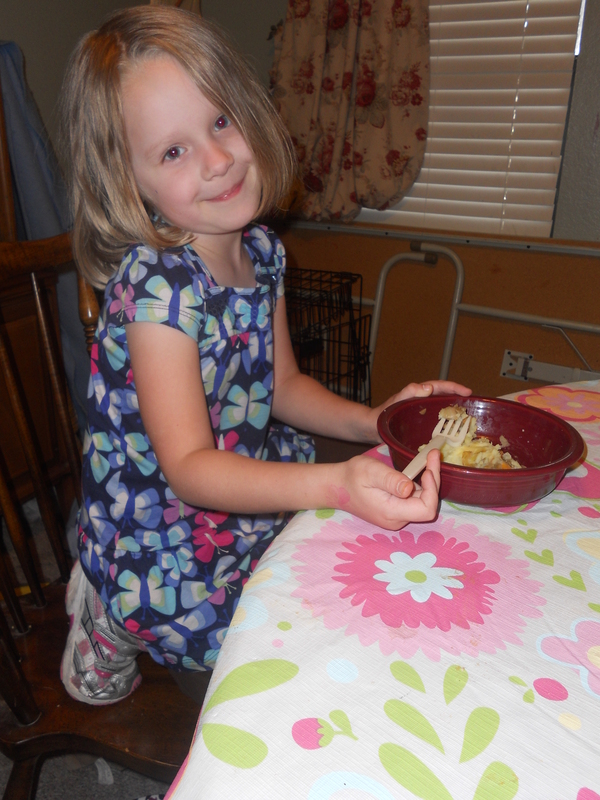 Normally she eats about four things: spaghetti, chicken nuggets, grilled cheese, and macaroni & cheese. Because of the approach we took to eating this month, and the casual way I treated it, I got her to try tofu in various forms, quinoia, soy meat, and a number of vegetables. I was prepared to send peanut butter and jelly in her lunches. It was a pleasant surprise when she requested soy ham and cheese, quinoia salad, tofu pudding, and mac & cheese with peas instead. Shopping vegetarian is easier than I thought. It became clear early on that we would be leaving behind the life of fast food we have lived. One of my concerns was having to run to the grocery store every other day to buy expensive ingredients and/or those ingredients going bad quickly. By doing a little homework before I went shopping the first time, I was able to smart shop, getting primarily frozen and pantry items with minimal fresh items. It was less expensive this way and I was then able to budget for organic, quality fresh items. Cooking is not a plot to make me crazy. Some people, like my mother, find cooking relaxing; I find it nerve wracking. I don’t have natural instincts that just tell me when to add flour to fix whatever is wrong with my potatoes. Additionally, I can’t just see ingredients and know how to put them together (which is weird because I am a great orderer–I can usually tell what flavors on the menu will be the best combination). Recipes stress me out because I am afraid of messing them up. However, as I mentioned previously, eating out was not going to be a daily choice, so I had to get over myself. This was accomplished by my sticking to relatively simple recipes in the beginning and trying more difficult things as the month went on. There were certainly some failures, but there were more successes and I now have a feel for some basics. For example, I was over at my mom’s the other night and my newly diagnosed diabetic step-father wanted something to eat but didn’t feel like going out. I threw some stuff in their pantry together and made a healthy vegetarian meal that pleased my mom, step-father, and kids. No recipe needed. It’s about choice . . . to a point. My mother is not a fan of my kids being vegetarians. She has made this clear on several occasions. One argument was that our pediatrician required kids to eat red meat once a week. I found later she left out the part that ended with “or take a vitamin with iron.” (She let that slip accidentally.) She then started in that I was forcing my beliefs on my children. I am wise enough that I did not point out that most parents do–it’s called raising your child. However, my husband is remaining a meat-eater and had a stronger argument: he didn’t want the kids to exclude anything but instead to make their own choices. That makes more sense to me. Saturday night, for example, my daughter wanted a cheeseburger at the restaurant and we ordered her a slider . . . with a side of broccoli. It marked the first time she’d had red meat in over a month (I know she’s had chicken once or twice). She enjoyed it, but she also enjoyed the broccoli. And this morning she asked me to make her quinoia for her lunch this week. It is my choice to abstain from meat, but my children can make up their own minds. That being said, I’m not keeping or cooking meat at home, in part because I have never liked to deal with raw meat, and in part because I think there are much better alternatives. The internet is both friend and foe. I found a number of great websites on vegetarian/vegan lifestyles, many focused on kids and families. There are a number of great recipes that I have tried and loved from those sites. But I also made the mistake of visiting and requesting information from PETA. To call their information graphic is an understatement. It truly made me sick to my stomach (as I’m sure was the idea). While I recognize they are going to present worst-case scenario propaganda, another thought occurred to me: if I can’t read or look at the process by which animals become food, I have no business eating it. My husband has actually fished and prepared the fish he caught–he can handle that kind of stuff. I can’t. So while I had been consuming fish, I think I have ended that part of my life as well. After thinking it over for several days, I went to get some fish one day at lunch and found I couldn’t stomach it. This month has been pretty fantastic overall–we’ve tried some new things, learned some new things, and I lost 10 pounds without doing anything other than not eating meat. I encourage all of my readers to try something new this month, be it giving up caffeine or taking a walk everyday. Think about your own wish fulfillment and how it would feel to try one of those wishes on for size. PS. I am currently posting my successfully tested recipes on my tumblr account, aka Moi. You can also receive them by following me on Twitter @AKellyAnderson. I have a deep love and respect for Kurt Vonnegut. Beyond his stories, his thoughts on writing and society continue to inspire me. Thanks to Brain Pickings, I am happy to provide this video version of his 8 Tips for Story Writing. I am especially fond of the third one which reminds us that our characters must want something. Perhaps it my focus on need and motivation is because I had a drama teacher who pounded us with Uta Hagen’s 9 Questions. Whatever the reason, I like how simple these rules seem and yet how often, in the pursuit of our own agenda, we forget them. What’s even more intriguing is when good writers have the skill and imagination to break them. What writer advice and/or rules to you like? I am a collector of many thing, including but not limited to, early edition books, milk glass, graduate English course credits, and wisdom. The last of this list takes the form of a number of quotes written down in a little journal that originated more than a decade ago. On occasion I have posted some on Tumblr, but my use for that is changing. So I present some of my favorite collected wisdoms from the Cakester Book of Quotes. Perhaps someday I’ll share some more of my stash. What quotes do you love? PS. Check out my quote on one of my favorite sites, Soul Speak. From time to time, I like to flip through my old work, especially the stuff that is in my limbo file (almost but not finished or finished but not published). I find this particularly helpful when I think I don’t have any new ideas. Often I find I can revise things easily, or I realize why the work never got finished (no central dramatic question! uneven point of view!) and make strides to complete it. Sometimes I just get a good laugh at how terrible some of my writing has been. Of interest at the present is what appears to be my current phase: The Masculine Identity Phase. It’s not something I realized I was doing (and still am), but a survey of my fiction writing turns up cherries on some common themes and characters. For some reason, I went into grad school writing female protagonists and left writing males. Other recurring things? Sense of identity, especially in questioning traditional ideas of masculinity. “What makes a man?” my characters all seem to ask in their own ways. The inheritance of disappointment or failure from parent to child. None of these are unique–they are in fact very common themes, but reviewing my work, beginning interestingly enough with my thesis, I seem hell-bent to look at these things repeatedly through different narrators and circumstances. Even my non-fiction work seems to focus on the male members of my family. I don’t think there is a discernible reason for this phase (I’m sure a critic or therapist would beg to differ, pointing out my ‘daddy issues’). Pondering it further, one thing that did occur to me is that I shy away from female protagonists because I don’t want to be pegged as a chick lit writer. The idea that a female writer can’t craft a female lead without being labeled in that way is disheartening. Perhaps that is all in my head, but I can think of too many adherences and not too many exceptions to that rule. When my creative writing students tell me they are afraid to write something, I smile and then tell them that is exactly what they must write, that they must work through what they fear. One of my former students takes great pride in throwing my own advice back at me, so I will beat her to the punch: My new assignment is to write a female protagonist, even if her story only ends up in limbo. At least it will be a break from a phase that I don’t want to turn into a rut. What about you, readers? Do you go through phases? What are you afraid to do in your writing? What assignment do you need to give yourself? Unless you are planning to hop a plane to Vegas after exiting the stage, avoid any dress that could and/or has been worn to a club. Same applies to dresses that have been worn to a cocktail party or prom or in a wedding. Don’t wear a dress that could double as Spanx. You will be walking across a stage (most likely). Now is not the time for the platforms that you can’t actually walk in. Make sure that as you go up the stairs, the hemline of your skirt will not go in the same direction. Remove the cap/hat. Be smart enough to figure out that in doing that, you will reveal hair that may not have seen daylight for years. Accordingly, brush your hair. The Dean’s List is not a place for boobies or booties. Cover ’em up. If you are being inducted into some sort of organization that involves candles (Phi Theta Kappa, for example), remember that hair spray is flammable. Your hair may be closer to God, but so will your body and the bodies of those around you if caution is not exercised. Nothing says “I am too cool for your award” like flip flops, jeans, and a knock off Ed Hardy Shirt. Do us all a favor–if you think you are too cool for the award, don’t come. It means we’ll all get to go home sooner. Avoid jewelry that can double as a weapon. Try smiling. No one is forcing you to be recognized. If you look happy about it, we might actually be happy for you (well, maybe). Each year the American Library Association (ALA) releases a list of the most challenged books of the year. 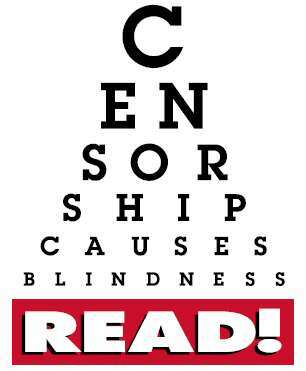 For those who don’t speak censorship, challenging a book means writing a formal complaint against a library or school asking that a book be taken off shelves because of the content. Banned, if you prefer the term. One of the questions I think all writers need to consider is who am I writing for? Limebird Sally is talking more demographic, which is also pertinent, but I like to have a specific person in mind when I write anything. To me it keeps writing from being completely self-indulgent (or masturbatory as I usually say). That is what journals and some blogs are for. – A concise summary of what this book is about – its overall theme and the central plotline i.e. why is your target audience going to love this book! If you have one, think about your current work-in-progress. Imagine by some strange chance you find yourself sitting next to an agent actively looking to take on new writers in your genre (and as this is make-believe of course they’d be happy to wait until you’ve finished it). You’re two minutes away from the train’s final destination (eurgh after those nasty films that sounds so ominous, but I’m just talking about Kings Cross, or your main terminal here!) and this is your big chance to pitch your work. The first class I ever made a bad grade in (a C) was handwriting in the fifth grade. No matter how much I practiced, my cursive was not the smooth, looping style that I was forced to copy over and over in my book. There was just something . . . off about it. Thankfully my mother reasoned that penmanship was certainly not a mark of intelligence (doctors anyone?) and didn’t worry about it. Twenty plus years later, my handwriting is still bad–my lowercase B looks like a six, for example. But it’s more than that. No matter what I do, how hard I try, there is always something off. My skirts always have mystery stains or dog hair, my picture frames are never straight no matter what tools I use, my eyeliner always ends up pooled under my eyes despite all the chemical precautions I take against it, my hair is always lumpy or slightly undone, my cooking is always a shade too dark or too light, my essays always have one typo, my car always has a scratch, my left earrings keep disappearing . . . essentially everything in my life, despite my best intentions, is always smudged, rippled, browned, snagged, scuffed, crooked, chipped, or warped. It’s like I’m stumbling, tripping, sliding, and skidding through life. In a word: I’m off. As the handwriting indicates, this is not a new problem. My life has been built around it. Never the best and never the worst, I’m usually pretty good or okay, but there’s something not quite right about whatever it is. It’s something that I have tried to work on. Measures have certainly been taken. And yet the off-ness remains. Sometimes it seems the harder I work against it, the more it rears its head. I was reading an article in Working Mother yesterday about how working moms expect perfection of themselves and how they should let go of those ideals. The effect was that I then felt guilty for not being harder on myself and not overcoming my off-ness. The question then is this: do I embrace that I am off, that I will never have straight pictures, scratch-free legs, and correctly folded fitted sheets? Do I acknowledge that things will always be slightly crooked and smudged? Or do I try to straighten myself out somehow? Is there some way to do that, like a metaphorical V8 that will shift me to line up with the world? I suppose these types of rhetorical questions will always be in the back of my mind. And it is for some of these reasons that I started Generation Cake almost two years ago. This represents my 100th post and I feel I am no closer to understanding myself or the world. However, I am thankful that I have someplace where I can share my thoughts with people who might just feel the same way. Thanks for reading, Cakesters. Here’s to another 100. Tonight for dinner m y daughter and I had a blast putting together a vegetarian Shepherd’s Pie. The basic recipe came from Eat Close to Home, but we have made some adjustments. Liliana noted while we were making it that since it didn’t hurt sheep for us to make it, we should call it Sheep Friend’s Pie instead. She and her 1-year old brother both had seconds. My meat-eater husband had thirds. This can also easily be made vegan. Enjoy! 1. Saute the onion in a small amount of oil until soft and clear. 3. While the lentils are simmering, make the mashed potatoes (see directions below). 4. Make a roux using 2 T butter and 2 T flour (to make a quick roux, melt the butter then mix in the flour to form a paste). Add roux and 2 T soy sauce to lentils. 6. Combine the carrots and peas with the lentils. Spoon the filling into an 9 x 11 baking dish. Using a spatula, spread the mashed potatoes over the top, sealing the edges. Bake at 350 for 15 minutes. 1. Bring a pot with 5 cups of water, the potatoes, and the 4 garlic cloves to a boil. Let simmer for 15 minutes until potatoes are soft. 4. Melt 2 T of butter and add 1/4 cup of milk. Keep the mixture warm on low heat until the potatoes are done. 5. Drain the potatoes and garlic then transfer to a bowl. Using a fork or potato masher, coarsely mash the potatoes. Add in the milk mixture, season with salt and pepper, and continue to mash until thoroughly combined. A few days ago I was having a complete artist-lame-vain freakout over editing my work for presentation. It’s so silly now because it was such a self-indulgent activity. What of my brilliant work should I cut? Damn you Time Limits for not respecting my rambling genius! I wish I could say that my reading was brilliant, but that would certainly be an overstatement. Although I have some modest high school oral interpretation experience (second in TFA State Poetry–if you know what that means, you know how little it really means) and a much more impressive BFA in Acting (NYU’s Tisch, darling), I am essentially a shy, antsy performer. My reading broke the cardinal rule–I never looked up to connect with my audience. I just read the piece and tried not choke up on the sections which were deeply personal (sting rays–one of my deep issues). However, even with all that, I think I might have gained my first fan. An attendee came up to me afterward during the panel part of the event and told me how much he loved my work, how authentic my portrayal of Aboriginal prejudices and culture were, and . . . how much my style reminded him of J.D. Salinger. Between us, I said yes without thinking because I didn’t want to seem stupid in front of someone who liked my writing. When he asked my favorite Salinger piece, I stalled before asking, “You are referring to J.D. Salinger?” I finally asked because I felt like I was a fraud if he was talking about some other Salinger that happened to be an Australian author that I was too dumb to know (my piece deals with Australia). Then I was off. I talked in depth about my love of Catcher in Rye. Those who graduated with me will hopefully remember reading this Junior year (even though she taught from CliffsNotes!). I remember every second of reading that novel because it was the first book I read that wasn’t a children’s book to which I deeply connected. I have even argued that teaching it to teenagers is important because it is really the first thing they can relate to (although with Teen Mom, perhaps The Scarlet Letter isn’t so far off). When Salinger died, I read a passage from it to my creative writing class and was even more grieved because no one in the room had read it. One of my deepest hopes in life is to own an original edition (that and On the Road). However, that doesn’t end my Salinger connection. My junior year at NYU, my acting professor had me do an acting scene based around Salinger’s “Uncle Wiggly in Connecticut” from his short story collection Nine Stories. We’ll skip over my acting talents to the point that I read the entire collection and loved it. In fact, it traveled with me for years. Something about his collection spoke to me. So naturally when I was given an assignment in graduate Creative Writing of picking a story I admired, I selected one from Nine Stories. The story was “A Perfect Day for Bananafish.” And through an almost painfully drawn out exercise, it suddenly clicked how to construct dialogue. I have not struggled with dialogue since and I have not picked up Nine Stories since. When that man brought it up, I started mulling it over. It would never occur to me to compare myself to someone like Salinger in any state or form. I could pretend to see the similarities–masculine dysfunction, mental disintegration, questions of identity, the banality of American existence? But in reality? Not so much. I’m just some girl trying to write some story.